Imagine that you went to see the Steven Spielberg movie, “Lincoln,” and all you got was the viewpoint of Southern white slaveholders during the Civil War. That is analogous to what you are getting from almost all of the major media coverage on Venezuela. Last week the New York Times did something it has never done before – in its “Room for Debate” section it offered differing views on Venezuela. In the 14 years since Hugo Chávez was elected president of Venezuela, the Times has offered many op-eds and editorials against Venezuela – including its own editorial board piece supporting the 2002 military coup (which they later backpedaled from without apology). But they have never seen fit to publish even a single op-ed that contrasted with their editorial line (or reporting, for that matter) on this oil-rich country. This contrasts with almost every medium-size or large newspaper in the United States – from the L.A. Times, Boston Globe, or Miami Herald, to even the neoconservative Washington Post, and scores of other mainstream city newspapers, which have all published at least one op-ed offering another side of the story. It’s worth revisiting the debate that appeared in the Times’ online edition because it sheds light on some of the problems with what we read and hear about Venezuela. Moisés Naím argues that Venezuela, whose economy grew about 5.5 percent in 2012 is headed for “An Economic Crisis of Historic Proportions.” (Well, at least he said “headed for” a crisis. Anita Issacs, a political scientist included in this debate, bizarrely refers to “Venezuela’s tanking economy” – kind of like the “United States’ tanking economy” in 2004). Well, that sure sounds scary! However, the International Monetary Fund (as of September) estimates Venezuela’s fiscal deficit at 7.4 percent of GDP. A “debt 10 times larger than it was in 2003?” – there is no source for this, but it is clearly a meaningless number. Because economies grow and there is also inflation, debt is normally measured against a denominator, e.g. the income of the country. According to the IMF (again September), Venezuela’s debt for 2012 is projected to be 51.3 percent of GDP, not a particularly threatening number (the average for the European Union is 82.5 percent of GDP). [A more appropriate measure of the burden of the foreign public debt – which is much more important than the domestic public debt — for a country like Venezuela, where about 95 percent of export earnings is from oil, and that revenue is in dollars, would be the government’s interest payments as a percentage of its public sector export earnings. This is also not very high – peaking in 2012 at about 3 percent of export earnings. See here for more detail]. Not sure what is meant by “the free fall of the state-controlled oil industry.” Venezuela adheres to OPEC quotas and is not trying to increase production beyond its quota. Naím also warns that “as a result of America’s own oil boom, U.S. imports of Venezuelan oil have recently hit a 30-year low.” And? Oil is sold on a world market; there is no particular reason it has to go to the United States. In fact, the Venezuelan government is quite happy to diversify its exports to countries that are more friendly to it than the United States has been. 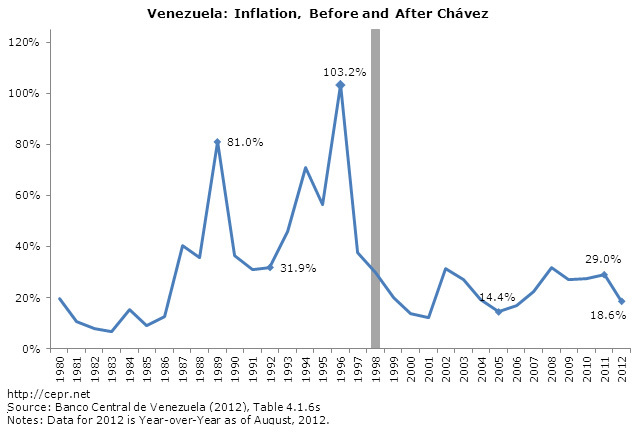 Inflation in Venezuela is clearly too high; although much lower than in the pre-Chávez era. But the most recent estimate [PDF] is 19.9 percent for 2012, which is down from 27.2 percent in 2010 – despite a rapid acceleration of growth from the recession, which ended in the second quarter of that year. The government will want to bring it down further, but this level of inflation is not by itself a serious threat to the economy of a developing country. Oh and by the way the “swollen number of public sector jobs in Venezuela” is about 18.4 percent of the labor force. France, Finland, Denmark, Sweden, and Norway all have public sector employment percentages in the 20s, with France at 22 percent and Norway at 29 percent. OK this is probably more detail than you wanted, but remember that the catastrophic view of Venezuela’s economy has been promoted by the Venezuelan government’s opponents –including most of the international and Venezuelan media– for 14 years. Like the plagues that God brought to the Egypt of the Old Testament, economic collapse will deliver Venezuelans from the evil dictator that they somehow keep re-electing by a wide margin. Disaster has always been just around the corner, but it never quite happened. There have only been two recessions during the past 14 years. One was directly caused by the opposition itself, in the 2002-2003 oil strike that was organized to topple the government. The other was during the world recession of 2009, when most countries in the hemisphere went into recession. Francisco Toro is an opposition blogger who, even more than Naím, has spent most of the past decade forecasting doom and gloom for the Venezuelan economy. For him, the end of Chavismo will come when the government is forced to implement austerity as “the country runs out of money and out of people willing to lend it more.” According to Toro, “Chávez has spent all of the windfall from Venezuela’s enormous oil exports, and then some: the country’s debt has quintupled in 14 years.” (another meaningless number). To give them their best argument, what both Naím and Toro, and other doomsayers are basically saying is that Venezuela will face a balance of payments crisis. Since they are not predicting hyper-inflation, that is really the only thing in their fantasies that can collapse the Venezuelan economy, e.g. as the Asian crisis of 1997-98 collapsed a number of economies in that region. But Venezuela has been running trade and current account surpluses for the past decade, since it recovered for the oil strike and political stability ensued. The exception was during the six months when oil prices collapsed at the end of 2008. The “headaches” that Naím refers to in terms of foreign exchange shortages, which have increased since the October election, are hardly a signal of impending collapse. Rather they are a result of the government trying to limit capital flight by denying dollars at the official rate to businesses that they think are not using them for legitimate purposes. If this results in too many shortages, the government will switch to another strategy. The current exchange rate regime is difficult to manage, it is prone to inefficiencies and corruption, and my own view is that Venezuela would be better off under a different exchange rate regime — e.g. a managed floating exchange rate that was maintained at a lower real level. But that is quite different from the idea, or recurring dream of opposition doomsayers, that these problems will lead inevitably to a balance of payments crisis that will collapse the economy. Of course the forecasts of catastrophe help promote capital flight by convincing Venezuelans that they should take their savings elsewhere. But here’s the kicker: Even if their dream of a balance of payments crisis were to come true, the Chávez government has friends. And some of these friends have a lot of dollars. China, which is sitting on more than 3 trillion in reserves, considers Venezuela to be a strategic ally and has loaned the government $36 billion since 2007. Most of it has been paid back, and about $20 billion was loaned at extremely low interest rates (1-3 percent). Brazil and Russia are also among the countries that consider Venezuela to be a very important partner in the region. They also havehundreds of billions of dollars in reserves. These countries would not want to see their partner and ally, the government of Venezuela, collapse because it needed a few billion dollars of hard currency to pay for its imports for a while, for example if oil prices crashed temporarily as they did in 2008. There are a number of reasons for this, but one is that a right-wing government is likely to ally with Washington. The Chávez government’s support for a “multi-polar world,” described as “anti-American” here, is quite appealing to most other governments in the world. Venezuela has the world’s largest oil reserves, and outside of Washington and the governments of Europe (which are not of much use to anyone these days), most governments don’t think that it’s a great idea for the country that is known throughout the world as an imperial power, with the world’s largest military, to also control the world’s largest oil reserves. The other side of the coin is that Venezuela’s oil reserves are also the main reason that Washington has been so hostile to the country, supporting the military coup of 2002 and intervening as much as it can to try and discredit, undermine, and de-legitimize the government. While these efforts have been enormously successful in influencing media and therefore public opinion in most of this hemisphere, they did not do so well with governments, especially in the Americas but also in most of the world. And that is the irony: Washington’s never-ending battle against Venezuela has in some ways made the Chávez government and its political party stronger, by helping to infuse the left vs. right political contest there with an anti-imperialist dimension that would put most of the world’s governments on the side of Chávez. Of course the most important source of Chávez’s continued electoral success has been the improvements in living standards that the majority of Venezuelans have experienced over the past decade: poverty reduced by half, extreme poverty by more than 70 percent, unemployment cut by half, a tripling of people eligible for public pensions and vastly increased access to health care and education. Indeed it does, and will.